​ Positive Behavioral Interventions and Support (PBiS) is an evidence-based, data-informed process that works to increase student achievement, school attendance, and school success while decreasing challenging student behaviors. By using a systemic approach incorporating all students, staff, parents, and settings, PBiS can create safer and more effective schools. Best of all, PBiS is proven to work. 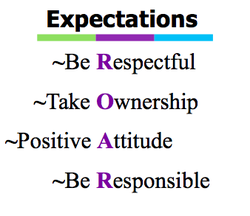 Behavior expectations are defined and taught to all students. These behaviors are also posted throughout the building and reviewed often. Families are encouraged to use the same expectations and rules that are taught at Cross County. Consistency between home and school helps students become successful. Benefits all students, and is not limited to any particular group. Is based on effective behavioral practices, instructional design, and strategies. What can you do to help your child stay on the path of positive behavior? Talk with your child about expected behaviors and what those behaviors look and sound like. Encourage your student to use appropriate language and tone. Discuss the school day with your child and celebrate any positive things that may have occurred. Attend school activities with your child.